Shaun Scott, staff photo Mercer Island Islanders junior midfielder Emil Talerman (No. 5) scored a game-high four goals against the Sammamish Totems on April 4 in Bellevue. The Islanders defeated the Totems 9-0. Mercer Island Islanders junior Emil Talerman was unstoppable against the Sammamish Totems in a KingCo 3A/2A boys soccer matchup. Talerman, who scored a game-high four goals, led the Islanders to a convincing 9-0 win against the Totems on April 4 at Sammamish High School in Bellevue. The Islanders (7-1 overall) have won six consecutive games since losing to the Issaquah Eagles in a non-league game on March 15. Sammamish dropped to 1-6 with the loss. The Islanders dominated the first half, bolting out to a 7-0 lead by halftime. Islanders’ forward Lucas Meek scored two goals as well in the win. Ian Onrust, Mitchell Meade and Mitch Graesser each scored a goal apiece for the Islanders. 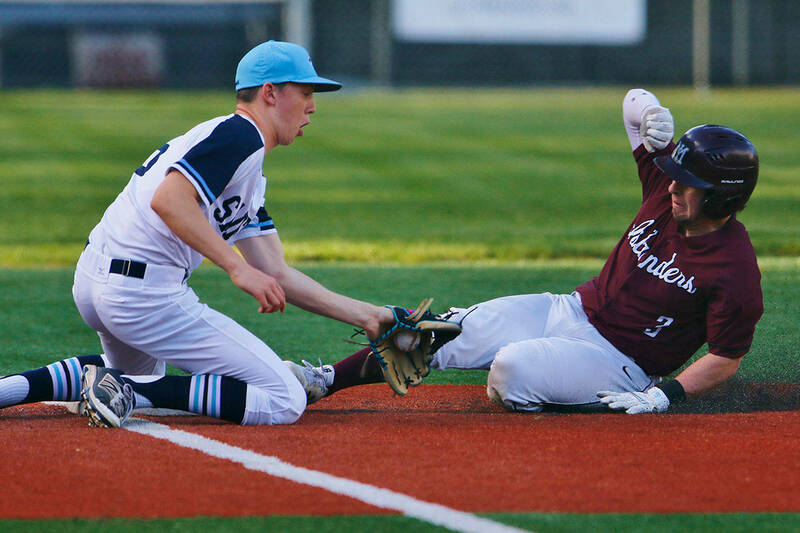 Mercer Island head coach Colin Rigby said the early season loss to Issaquah was just what the doctor ordered for his squad. “The Issaquah game was the most important game of the season for us because we needed a wakeup call that we need to work in every second of every game. The one thing we always take away from every KingCo game is to improve. Speed of play is the No. 1 thing we try to work on. Games like this is good for us to work on how quickly we can move the ball and keep it on the ground,” Rigby said. Sammamish head coach Darryl Gonyea said Mercer Island is one of the top teams in Washington. Gonyea believes surrendering just two goals in the second half was a step in the right direction. The Islanders, who captured second place in the Class 3A state tournament last season, are focused on continuing to improve as the season progresses with a run deep into the postseason etched in their minds. “We’re just trying to go out here and play our game every day. Of course we like a big win like this but it is not all about what is going on the scoreboard. We want to continue to get better toward the end of the season and see how far we can make it. That is when it really counts. I think that is the biggest deal there,” Talerman said.